Councilwoman Maria Quiñones-Sánchez asks a question during a City Council hearing on the opioid crisis at City Hall in Philadelphia on March 12, 2018. The hearing Monday morning in City Hall was billed as an opportunity for City Council's public health committee to assess the effectiveness of the city's response to an epidemic that Health Commissioner Thomas Farley called "the worst public health crisis in a century." Three years into the crisis: Nearly 3,000 deaths. Up to 70,000 people across the city using heroin. Four homeless encampments where people in addiction have been sleeping for months. Twenty people, including city officials, treatment providers, advocates, and community members, were slated to speak on seven panels. They and their supporters filled the gallery and brought dozens of pages of testimony. But the meeting never made it past the opening stage with Farley and his colleagues. Instead, Council members held the floor during a three-hour hearing that for some was a chance to air complex questions on a spiraling crisis — but for most seemed to serve as a primer on some of the most basic aspects of an epidemic that has saddled Philadelphia with the highest overdose death rate among major U.S. cities. The community members were never called to the floor. It was a sign, frustrated advocates said, that as the city moves forward with plans to fight the opioid epidemic, some Council members are only just beginning to consider the contours of the crisis. "There's a lack of coherence here," said Casey O'Donnell, director of the Kensington neighborhood development group Impact Services. The meeting came nearly two months after Mayor Kenney's administration announced that it would support the opening of safe-injection sites for people in addiction to use drugs under medical supervision and get access to treatment. It's a controversial idea that's gaining traction in the United States and has been in place in Canada and Europe for decades. For months, detractors and supporters alike have mobilized, debating the idea online and at community meetings. But on Monday, the sites were something of an afterthought: Councilwoman Cindy Bass asked Farley's panel whether the proposal was still on the table. "We are at the very beginning of the process," said Deputy Managing Director Eva Gladstein, adding that the city was not planning to fund the site but could help prospective operators search for a location and provide outreach services. It was the only substantial exchange on the proposed sites. 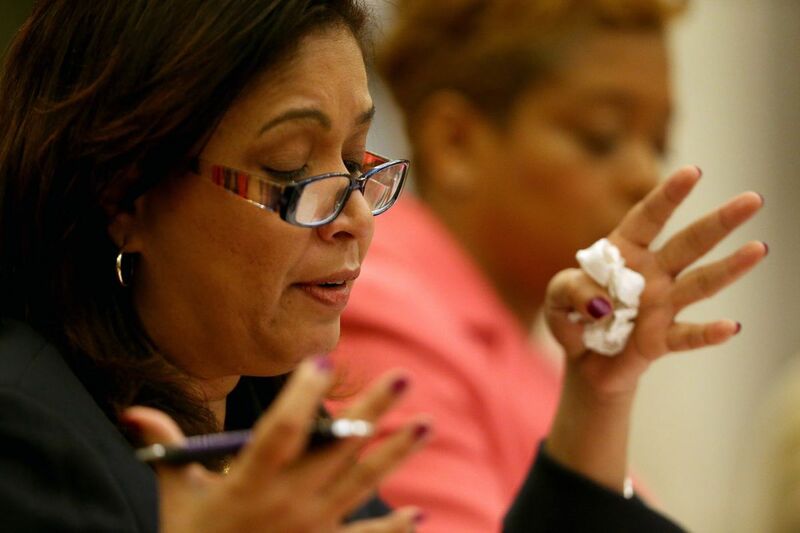 Councilwoman Maria Quiñones-Sánchez, whose district lost at least 287 people to overdoses last year and is at the heart of the heroin epidemic in Kensington, convened the hearing. Her district is home to the four encampments along Lehigh Avenue where people in addiction have been living since the city cleared an older encampment on Gurney Street last summer. Quiñones-Sánchez said the Department of Behavioral Health and Intellectual disAbilities Services needed to be more transparent — with Council and the public — about the treatment providers it funds: "People feel like the system is big and out of control," she said in an interview after the meeting. City Controller Rebecca Rhynhart is auditing the agency. And Quiñones-Sánchez said she was frustrated that the city hasn't moved faster to clear the Lehigh Avenue encampments. The city has one shelter in Kensington, a 40-bed respite center designed for people in addiction, and is planning to add 80 beds in the neighborhood. There are about 200 people in the bridge encampments, said Liz Hersh, director of the Office of Homeless Services. Quiñones-Sánchez said that wasn't enough. "How are we ever going to catch up?" she asked. "Why is it OK for us to have these encampments in Kensington?" Hersh said it's difficult to find sites for such centers, which do not require sobriety to enter and are designed to meet people in addiction where they are. "The community is very divided," she said. She said her agency is "absolutely not" moving fast enough. "At the same time, we're doing what we can." Liz Hersh, director of Homeless Services, during a City Council hearing on the opioid crisis. Other Council members used Monday's hearing to ask Farley and his colleagues more fundamental questions about the opioid crisis itself. Councilman Bobby Henon of the Sixth District, where at least 122 people died last year, asked the panel about the ins and outs of detox and how patients choose medication-assisted treatment. Councilman Mark Squilla of the First District also asked the panel for statistics on the effectiveness of medication-assisted treatment, in which drugs like suboxone and methadone, opioids themselves, are prescribed in a controlled setting to stave off withdrawal. Panelists replied that evidence shows the treatment gives patients the best chance for recovery and is twice as effective as simply detoxing. "The more we argue around whether it works or not," a doctor with the Department of Behavioral Health and Intellectual disAbilities Services said toward the end of the hearing, "the less likely we're going to get to the outcomes we want to achieve." O'Donnell, of the Kensington neighborhood group, was supposed to testify but did not. He said he'd been disappointed by that line of questioning. "It might be a really good idea to have someone that's an expert on the science of addiction to inform interested parties prior to convening like this," he said.